As the temperature rises and the final snow-lined sidewalks are cleared, we are all itching to strip away our down jackets, flannels and velvet pieces and opt for lighter fabrics. While silk, cotton and linen are no-brainers for a warmer climate, suede has the tendency to raise a few eyebrows. This spring, however, the smooth cloth is wearable, refined and undeniably chic. Showcased in dainty pinks, Jill Stuart’s series of on-trend separates gave a feminine twist to an array of slim silhouettes. 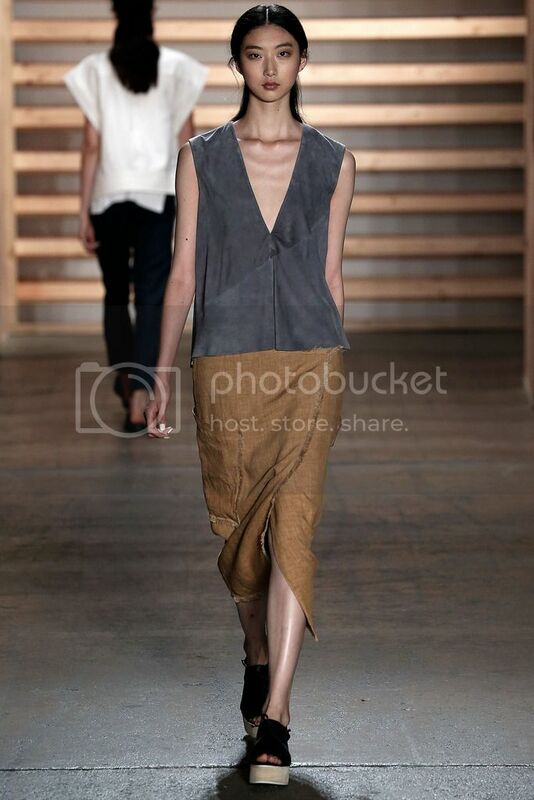 Meanwhile, a grungier vibe was offered at Tibi’s runway show. Between the range of earthy neutrals and the raw textiles that were coupled with the tactile suede, Amy Smilovic's take on this trend was undoubtedly made for fashion's cool girl. Citing Charlotte Rampling as an “invisible muse,” Jason Wu’s collection provided an utterly elegant alternative to this trend. Flirty mini dresses and coats nipped at the waist in deep blue and olive, respectively, would’ve been just as stylish during Rampling’s time as they are today. 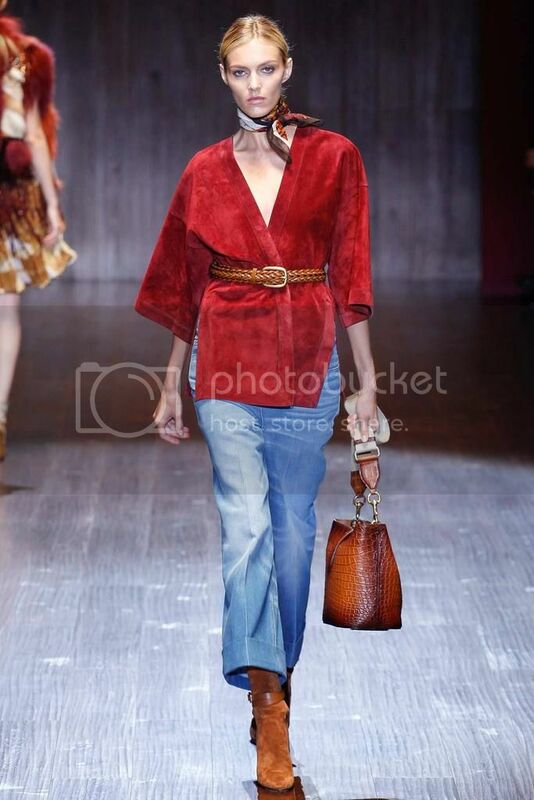 Before her departure from Gucci, designer Frida Giannini gifted the Italian house with a seventies-inspired collection. In a sea of suede, Giannini’s textured top against flared jeans and a silk scarf truly sang. If you're yearning to take on a new sartorial challenge, look no further than Derek Lam’s seriously suede collection. With patchwork pieces and head-to-toe ensembles, the New York designer proved that this trend has street style appeal. When it comes to trying your luck at this trend, accessorizing with a touchable shoe or purse seems like a no brainer. Chic as it may be, expand your wardrobe this season by investing in suede apparel —the results will be worth it. And with a range of price points, there is no excuse not to give in to this fad. Easing into suede? Instead of taking the plunge with one of Derek Lam’s full looks, opt for equally-striking, streamlined separates. Start with a simple suede skirt and pair it with a crisp white button-down. A girly halter is the next step, and will look fetching with a pair of boyfriend jeans. Or turn heads with suede trench in a versatile neutral. Last but not least, up the sartorial ante with a polished dress. But before you go ahead and explore the wonderful options this fabric has to offer, order a suede brush. After all, nobody likes neglected suede. Will you be investing in suede this season? Sound off below! Forget canines, technology is man’s (and woman’s) best friend. According to the Pew Research Center, 25 percent of teens are using technology constantly. And with a perpetually full inbox and a coveted Instagram to maintain, it feels as if, regardless of age, we are all forever online. It’s no surprise that technology has recently been infused into what we wear. From the Apple Watch, to Will.i.am’s techie-friendly collaboration with Gucci, to a slew of smart gems that are hitting the market, wired accessories are a must. But with all the smart bands out there, finding a versatile, stylish purse that possesses technology qualities is no easy feat. Thankfully, Carnise McIntosh has remedied this fashion woe with Leoht. With a rechargeable battery, two built-in USB ports, and an external use interface panel, this line of bags is perfect for the woman on the go. Style nerds, welcome to the 21st century. The Trendologist was fortunate enough to chat with Carnise about her collection and the future of smart accessories. The Trendologist: Congratulations on the fantastic line! What inspired you to create a bag that is both tech- savvy and stylish? Carnise McIntosh: Thank you so much. The team is very excited. Pure necessity! When I began to solve multiple daily problems I was encountering using technology, I came up with the idea for Leoht. As I began sketching the tote design, one of the first things that was very important to me was that it looked stylish. Coming from a sales background, you learn quickly that if it doesn’t look good, nobody will buy it – girl or guy, fashion or tool. Presentation is everything. Function is important, but style does matter. TT: What are some of the techie features that are included in the tote? CM: The tote has six features, four of which are techie. [There is] a built-in 6k mAh battery (that can charge your smartphone three to four times or tablet one to twotimes), controllable interior LEDs, two built-in USB ports, an external Power Panel (battery indicator and micro USB port for charging on the go), and wireless Qi recharging via it’s charging plate. The [bag] also includes a cool extra feature called the Alcove that hides important valuables or unmentionables. amenities able to fit into one tote? CM: That’s the core of our company. We are a hardware company first. We’ve [created] and designed an entire custom technology system that is built directly into our bags. The two influenced each other making it truly fashion technology. We didn't take two existing products and simply slap them together. Leoht bags are designed mechanically and aesthetically together from the ground up. As we release new collections, both the exterior and interior of Leoht’s will evolve. TT: Why name the brand Leoht? CM: Leoht is the Latin root word for “illumination” and “light”, which was the first technological integration that sparked the concept. TT: What was the design process? CM: It was a growing design process. It started with the technology first followed by the handbag design. As I tried to combine the two together, they weren’t working as separate components. So I went back to the drawing board, stared from absolute scratch and designed them together. Piece by piece, step by step. By doing so, it allowed me to understand the construction necessary for all parts to work seamlessly. TT: Who is your target customer? CM: For this collection, the modern women is our target customer. The 7:00AM to 11:00PM [woman], the go-getter, the student, the businesswoman, the mom, the planner. “Modern women” is a broad definition because women’s needs today are vast, but the one thing they all have in common is that their world, whatever it is, doesn’t stop. The Leoht tote is perfect for her. TT: Where is the tote available for purchase? CM: Currently the Leoht Tote is available for preorder on Leoht.co. 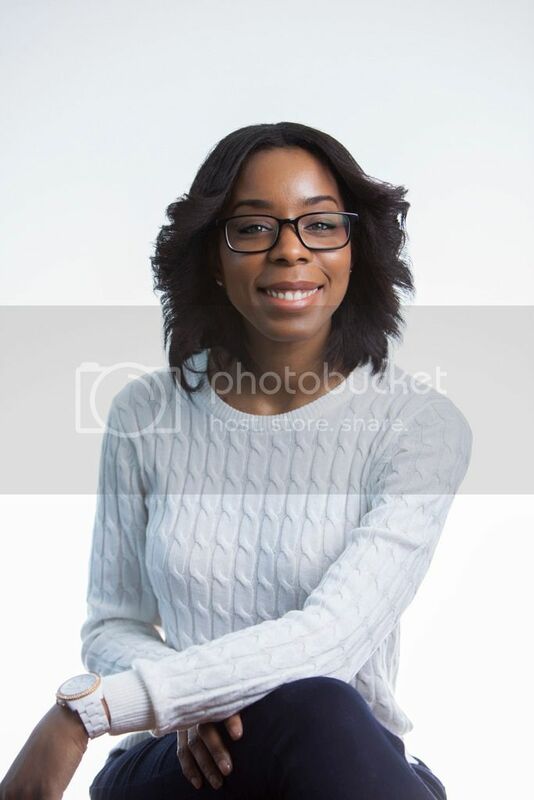 TT: I would love to hear more about your background! Tell me about your previous experience with both fashion and technology. CM: My background is uniquely part arts and part science. I grew up as an artsy child. I’ve known nothing but the love of design my entire life, yet somehow I was always immensely fascinated by natural sciences. As an adult, I intersected the two without knowing it. My studies in graphic design was heavily influenced by science and math. I entered the world of consumer electronics while in college, which encouraged my fascination of tangible technology. Being a graphic designer and working for companies like Apple and AT&T gave me further insight into worlds where beauty, desire and well thought=out innovation had an outstanding effect on the human condition and the experience was life changing. As a professional “visual problem solver”, when the time came to create Leoht, I had an excellent road map to ensure a fantastic team, product and experience in building the company. TT: What advice would you give to individuals who are also looking to connect the fashion and technology industries? CM: Be honest to both elements. If it does all of one and little of the other, start over and keep developing until it comes together. If wearable technology and fashion technology are to ever evolve into the norm, then they must work together cohesively and unobtrusively. It is in the hands of inventors, creators of these new innovations to make them as seamless and and easy to incorporate into our daily lives [as possible]. TT: It’s no secret that fashion and technology have been merging more over the past few months. Why do you think techie accessories are just starting to hit their stride? Do you think this is a fad or do you believe more designers will create rechargeable, smartphone compatible (amongst other features) accessories and apparel? CM: Two things have happened in a very short period of time. The popularity and accessibility of portable connected devices and with it, the second thing, a human connection to the benefits of these devices on a scale much bigger than most realize. Wearable, fashion technology is becoming “reinvigorated” because mainstream comfort levels with other portable devices and modern technologies has become the norm. Long-term benefits become clearly understood by having such enhancements in our lives, and so the curiosity becomes a demand of goods. Life imitates art, and vice versa. If we can think it, it will be. Designers and inventors will create what the public demands. For now, they want to be entertained by the possible benefits of wearable, fashion technology. Very shortly, they may demand nothing less in nearly any accessory or apparel that they buy. Wearable technology is not a fad: it's simply in the infancy of its legacy. TT: What do you think the fashion-technology crossover will look like in two years? Do you have any plans to expand Leoht? CM: On the horizon of fashion technology, the very idea of what “technology” looks like is going to change. The “tech” of things is striving to be invisible but immensely beneficial. We are seeing most of it in health and sports related garments initially from leading brands, but young daring designers will begin to experiment with sensors and smart fabrics for color manipulation, temperature regulation and haptic interaction for ready-to-wear, outwear, footwear and more. Leoht has an exciting and expansive future. We will continue to push the elements of beautiful, accessible and absolutely functional, wearable technology. 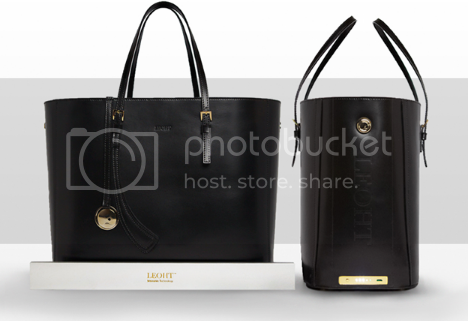 Dying to get your hands on a Leoht bag? Follow the brand on Instagram and check out the brand's Kickstarter. After a winter filled with debilitating blizzards, slick roads and slushy aftermath, there is light at the end of the tunnel. With spring just around the corner, scheming an outfit that consists of more than an oversized sweater, pair of jeans and clunky snow boots won't be easy. For instant outfit inspiration, take a look at the Trendologist's picks for top spring 2015 trends. "Florals for spring? Groundbreaking." As the overstated, yet accurate, line from The Devil Wears Prada decrees, taking a sartorial lesson from the hyacinths and peonies that bombard your deli corners is passé. 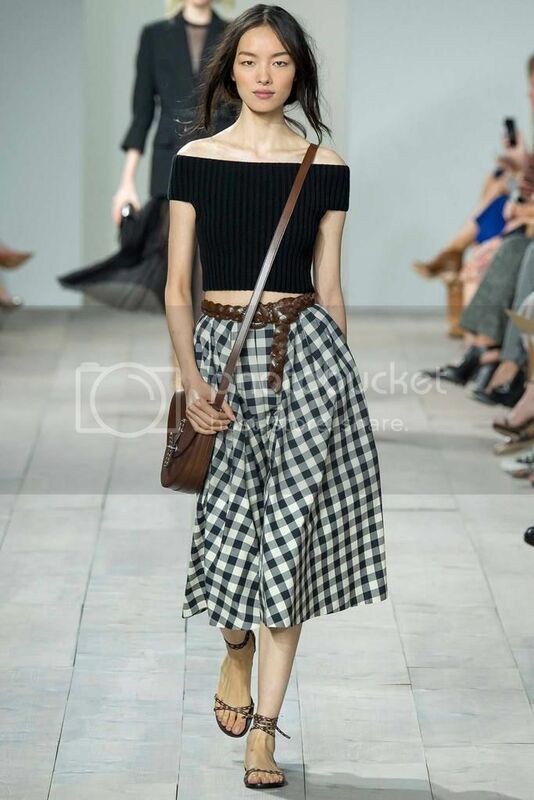 A print that's equally springtime-inspired, yet significantly less cliché, is gingham, which happened to run rampant on the spring runways. Far from Mary-Ann's traditional ensemble, designers' takes on this pattern offered more gravitas (and no coconut cream pie). 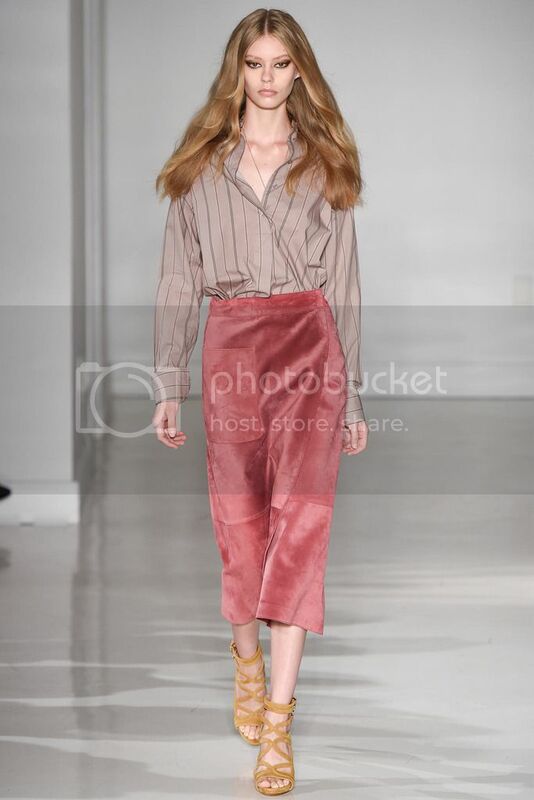 Always at the fashion vanguard, Joseph Altuzarra showcased a polished alternative to this usually casual motif. The New York designer's collection of ladylike power suits in an array of colors is completely office-friendly. Equally feminine and sophisticated is Oscar de la Renta's heap of statement jackets that debuted at the late designer's farewell show. Paired with a delicate lace top and glamazon earrings, de la Renta's version of this trend exudes a "Lady Who Lunches" attitude. But not every example of gingham this season must adhere to prim and proper standards. Styled with a wide belt and off-the-shoulder sweater, Michael Kors's full skirts are the perfect way to give this feminine print an offbeat twist. 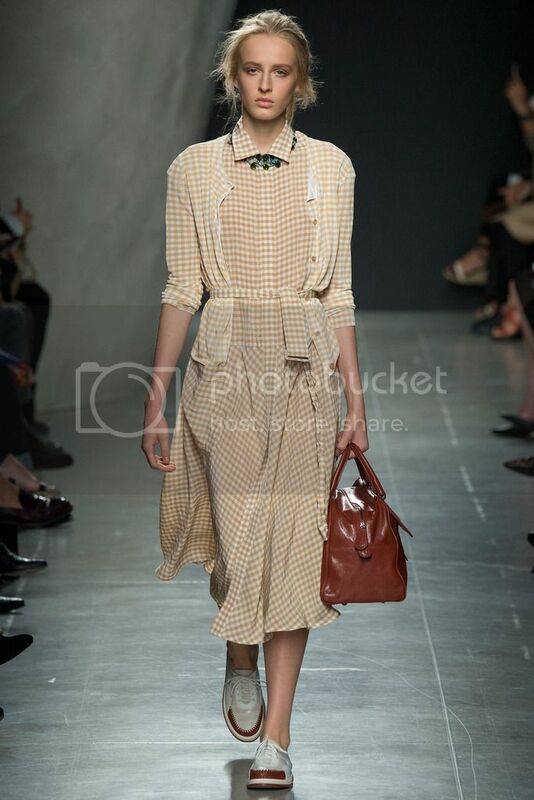 And what about Bottega Veneta's peachy shirtdress? With the right accessories, this gingham-clad getup is perfect for almost any occasion. If you haven't gotten over your style rut from this year's harsh winter, remedy your wardrobe with a fetching matching top and shorts a la Diane von Furstenberg's spring show. 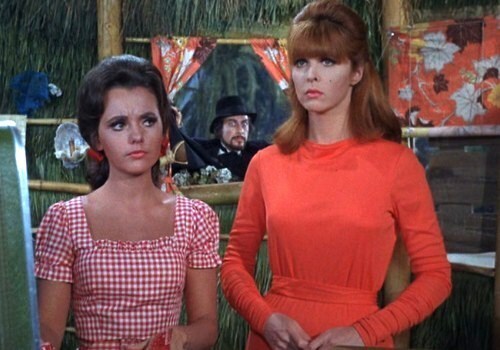 Rid this ensemble of any Gilligan's Island connotations with a pair of platform sandals. Repeat after me: I will not dress like a farmer, I will not dress like a farmer. Though top designers deem the cheery print worthy of our spring wardrobes, gingham tends to veer into barnyard territory. Free yourself from any Old MacDonald connotations by matching this print with modern, or ultra girly, silhouettes. While a checkered cropped shirt or pinafore dress may read campy, Michael Kors's mint halter dress is a forward-thinking replacement. Chloé's ruffled iteration is risky, but will add dimension (and a smile) to your look. Now that selecting au courant checkered pieces is a slice of sartorial cake, how does one style this notoriously finicky print? Play off the pattern's color. 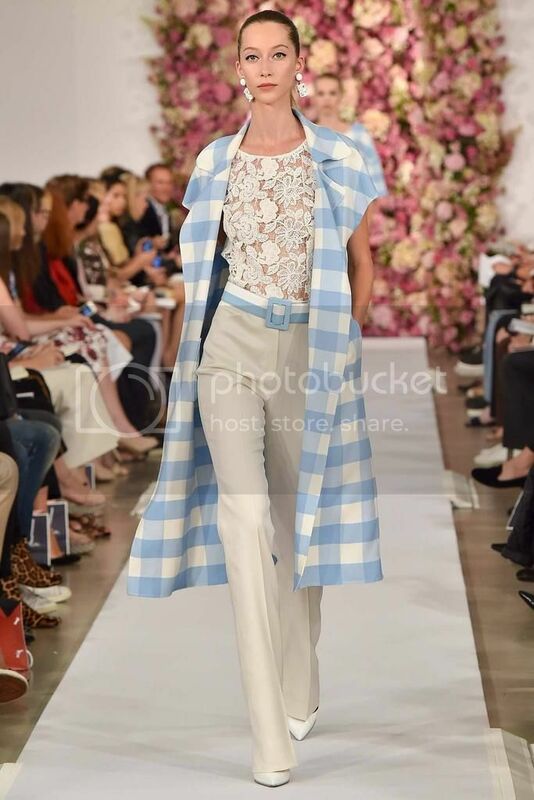 A cobalt overcoat will look striking with baby blue and white gingham; however, the look's monochromatism will surprisingly appease the farm girl fad. But if your closet is lacking vibrant statement pieces, opt for crisp white pieces to score an effortlessly chic outfit. Not ready to take the plunge on this trend? Ease into this phenomenon with a sweet gingham bikini.